With Tesla purportedly gearing up to introduce an all-electric semi next month, diesel engine supplier Cummins took some of the automaker’s buzz away on Tuesday, revealed an all-electric prototype truck of its own. Billed as a Class 7 Urban Hauler Tractor, the 18,000-pound truck was built by Roush and is geared for local deliveries, according to the Indianapolis Star. The company said it plans to begin selling a 140 kWh battery pack for bus operators and commercial truck fleets in 2019, reports Forbes. With a claimed range of 100 miles, it certainly seems apt to handle short drives, and Cummins said it only takes an hour to charge. By the time it’s introduced in 2020, Forbes reports, the company hopes to drop that number to 20 minutes. A hybrid, with a diesel engine used on-board as a generator, is planned later and will offer 300 miles in range. 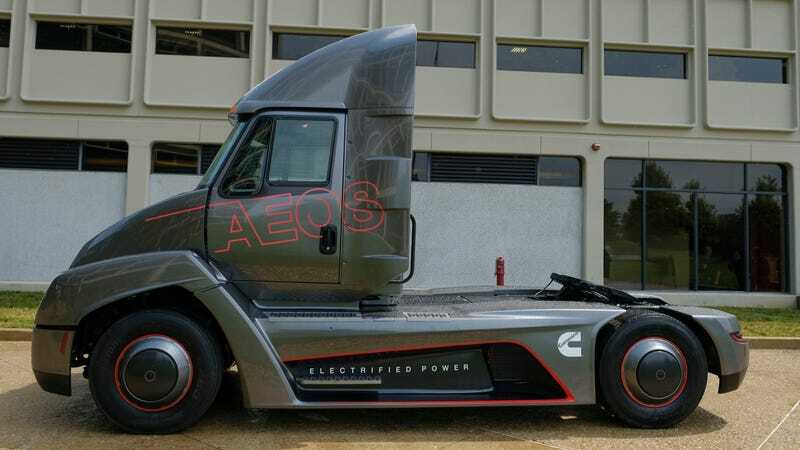 Cummins’ chief exec, Thomas Linebarger, told Forbes that electric technology isn’t quite ready for 18-wheelers, mostly due to the long distances they travel. Tesla’s truck will reportedly be set to handle lengthier tasks, with 200 to 300 miles on a single charge, but that remains far below the 1,000 miles a typical heavy-duty truck can handle on one tank of gas. Cummins may have introduced a prototype truck cab to show off, but the company only intends to produce the powertrain for trucks, Forbes reports.